The material used for the pads has an operating temperature range. If this range is exceeded the pad materials melt and can lubricate the disc rather than provide friction. They can also vaporise, or ‘gas-out’ which creates a layer that has less friction. As they cool again they will create a glazed brake pad and brake rotor. Pushing the brake pedal down with glazed rotors and pads feels like you are pushing against a piece of wood, and that there’s hardly any stopping power. 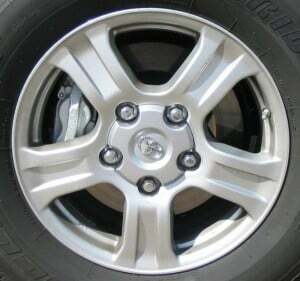 This image shows a typical disc brake with the calipers on the left. The brake pads are in the caliper. The bigger the disc and the caliper, the more heat it can disperse. If you boil the fluid the brake pedal first feels spongy because air bubbles form in the fluid and they are easier to compress than the liquid, but then goes to the floor and you have no braking power. It can happen extremely quickly. Brake fluid is hygroscopic – it absorbs water. This happens over time. The more water it has absorbed, the lower the boiling temperature, therefore old brake fluid is more likely to overheat than new brake fluid. Once you have boiled your brake fluid you will need to replace it. 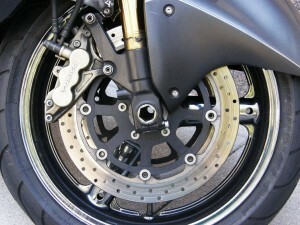 Some vehicles might have slotted or drilled brake rotors, like on the motorbike brake above, to help keep the rotors cooler. Green fade is caused by hard braking on new brake pads. New pads should be bedded in correctly on used rotors. Used rotors tend to be more stable and even than new ones. Each manufacturer has a different bedding in process. Whether you’re tackling the Southern Alps or the Bombay Hills there are long downhill sections that can cause severe brake fade. Trucks have engine braking to help with this. Motorbikes tend not to suffer too badly because they are light, but are not completely immune, especially if travelling fast. Cars, especially those towing trailers, can run out of braking power quite quickly. If you are travelling on a long downhill it might be several kilometres where you have the brakes applied. There’s only so much cooling that air can do, even if you have ventilated brake discs or ducts in the front spoiler that channel air onto the discs. The faster you are going and the heavier your vehicle, the more force the brakes have to dissipate, and this is done using heat. You’re in greater danger of it when towing. Many people tow boats and caravans in summer and forget about the added stress on their car’s brakes. If the trailer is braked, that will help reduce the strain. Every car will have two specification: one for towing an unbraked trailer (this is usually around 400-750kg), and one for towing a braked trailer (usually anywhere from 1000-3500kg). To reduce the chance of brake fade simply change down a gear or two on the downhill slope and let the engine take some of the braking load. You will see signs advising trucks to do this, and they should be observed especially if you are towing a trailer. If you are driving a car with an automatic gearbox, take it out of D (drive) and move it to one of the numbers in the gear shifter, e.g. you might have L, 2 and 3. Be careful not to over-rev the engine. 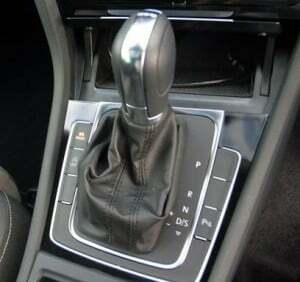 If you have a sequential manual mode, move the gear lever into that mode and change down one or two gears. If brake fade happens, you need to stop the car as quickly as you can. Get it in as low a gear as possible as quickly as possible without destroying the engine. They engine can rev to the redline fine. High gears won’t provide much engine retardation if the engine is only revving at 3000-4000rpm. In a petrol engine you will need to be at 6000rpm+; with a diesel engine your redline might be at 5000rpm, so try not to over-rev the engine too much. If you blow up the engine you’ve got a whole new set of problems. Pump the brakes. Try gently applying the handbrake, but don’t apply it swiftly otherwise it could cause you to spin. The handbrake won’t have much power, and it will quickly overheat itself, but it will help. The handbrake will only work on the rear wheels. If you are travelling at quite a low speed, weaving will reduce your speed because some energy will be taken up in the cornering action. However, this is extremely dangerous if there is other traffic around, or if you are going faster as you might either hit another vehicle or lose control. Car safety systems such as vehicle stability control, which rely on braking, will not be able to assist you if you have brake fade. Start looking for potential exits. This could be a side road, or a piece of land that goes uphill (as long as you think you will stop in time as you don’t want to launch yourself off the side of the mountain). It’s important you scrub off as much speed as possible because you will end up out of control and potentially run into the back of another vehicle pushing it off the road (and possibly off the side of a mountain, too)! If you have a trailer and it’s braked you might still be getting some braking power from that. If not, the trailer is a dangerous liability and puts you are risk of jack-knifing on a sharp corner. If you have your car in a low gear, you are using the handbrake, and pumping the brake but you are still not slowing down you need terrain and objects that will help your car slow down. These will damage your car, but not as much as running into another vehicle. Bushes and hedgerows will reduce your speed, as will fences and stone walls (be careful you don’t flip the car). A tree any bigger than a sapling will be very solid and is likely to stop your car abruptly – this may be a last resort for you. Once you have brought the car to a stop your brakes will be extremely hot and you are at risk of warping them. I have cracked a brake rotor and warped another after a few laps at a track day through leaving the car parked, so don’t underestimate the heat involved as it can be several hundred degrees. I have also seen a hubcap bubble and melt when a friend drove her car 10km with an improperly installed front brake calliper that caused the pad to push against the rotor. If you know you’ll be on a long descent slow down early, change down early and be aware of any signs of brake fade. If you notice brake fade starting to occur, bring the vehicle down to a slow speed and keep it rolling but in first gear where it’s not going to get away from you. This will prevent you from warping your brakes.